During a recent seminar about quantum computer technologies, participants learned about some of the complex, inner workings of the equipment and the current state of the industry from Robert “Bo” Ewald, president of D-Wave and a member of the White House Information Technology Advisory Council. As president of D-Wave Systems, Ewald is one of a handful of technology leaders advancing quantum computing and helping others to understand how qubits—a form of particles based on quantum properties—work, and how the technology is expected to improve computer processing exponentially. 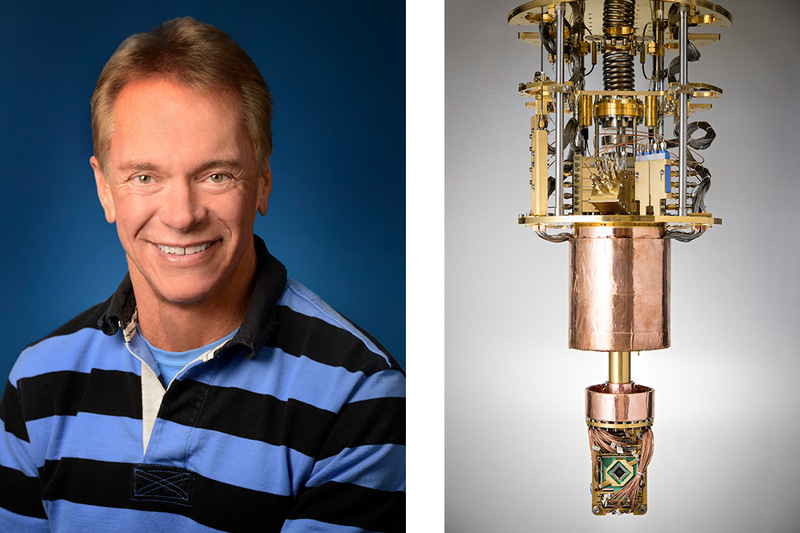 Ewald spoke to more than 40 faculty-researchers and students from RIT and the University of Rochester on Sept. 20 about quantum computing, a high-tech growth industry in need of skilled workers. “This seminar was an important way for us to learn even more about industry needs for this next generation of high-tech computing and what we can translate into additional coursework and research contributions to help advance the state-of-the-art,” said Sonia Lopez Alarcon, associate professor of computer engineering in RIT’s Kate Gleason College of Engineering, the event sponsor. RIT currently has faculty-researchers leading courses in the underlying quantum mechanics necessary to build quantum computer hardware and software. Others are immersed in the development of quantum dots and photovoltaic technologies, for example, using a variety of substrates and materials. Possible applications for the technology include cybersecurity, bioinformatics, pattern recognition and anomaly detection, several key research areas at RIT. D-Wave, established in 1999, builds computers powered by quantum physics applications with more powerful computer chips on the core circuits. The company has been building the ultra-high tech systems used by organizations from NASA to Los Alamos National Laboratory to improve computing services. This past year, the U.S. government made available more than $1 billion in funding for universities and companies to further research and development of quantum computing hardware, software and possible applications. Today’s computers use bits—the conventional 1s and 0s used to calculate encoded information. Quantum computers use more powerful bits, called qubits, often based on superconducting technology and quantum properties to create larger structures. With these more powerful properties, quantum computers can process digital solutions faster than ever, but also with more energy efficiency. The challenge, however, is the processing can sometimes be unpredictable and system components need to be cooled to near absolute zero temperatures, comparable to temperatures found in space. Yet, there are promising advantages, said Ewald. “The machines use about 25 kilowatts of power; this is less than the lights in the room. Cabinets holding the main components are like Russian nesting dolls. There are 16 layers, with decreasingly colder temperatures at each layer before getting to the computer at the bottom of the stack,” said Ewald, who compared the internal components of a quantum computer to thousands of inter-connected neurons and synapses able to perform millions of calculations per second. This power could solve problems of processing complex organizational and mathematical data and meet necessary energy efficiencies. For example, the energy needed to run Google data center servers could power the city of San Francisco for a year, according to reports by the California Energy Commission. Incorporating quantum computers could balance the challenge of high levels of processing with energy requirements.